This genuine kunzite specimen is 2.5" long x 1.3" x 0.8"
This beautiful kunzite crystal is unheated and untreated with pale pink natural color. It is transparent with some large gem-grade areas inside! This natural color kunzite crystal is 2.3" long x 0.8" x 0.75"
This natural kunzite crystal has very pale pink natural color. It has large gem grade areas inside and would yield 25 carats of eye clean gemstones. See also an opposite side view of this natural kunzite crystal. this natural color kunzite crystal is 2.3" long x 0.9" x 0.7"
This genuine kunzite crystal has light yellow natural color. It is mostly transparent with a large facet-grade area inside! This kunzite crystal is 3.75" long x 1.4" x 0.8"
This unique kunzite crystal is unheated and untreated with light pink natural color that grades into light yellow-green color at one end! It is transparent, and it would yield a single large lightly included gem weighing 70 carats! See also another view of this natural bi-color kunzite crystal. This kunzite crystal is 2.2" long x 1.8" x 1.2"
This unique bi-color kunzite crystal is unheated and untreated with light pink natural color at one end that grades into light yellow towards the opposite end. It has very fine transparency, and it would yield 40 carats of eye clean faceted gemstones! It is naturally terminated with terminations in very good condition. See also another view of this natural bi-color kunzite crystal. 3.3" long x 1.7" x 0.9"
This genuine kunzite crystal has light yellow natural color. It is semi-transparent with several large facet-grade areas inside! Natural kunzite dimensions: 6.5" long x 1.6" x 1.1"
This natural kunzite crystal is unheated and untreated with yellow natural color. It is transparent with several facet grade areas inside. This yellow kunzite crystal is naturally bi-terminated with terminations and prismatic faces in very fine condition. See another view of this fine collector quality crystal of natural color yellow kunzite crystal. Yellow Kunzite Crystal measurements: 3.6" long x 1.3" x 1"
This fine quality kunzite crystal is unheated and untreated with beautiful yellow natural color. The upper 40% has amazing facet grade transparency! See also another view of this natural fine quality yellow kunzite crystal. The tip is covered with naturally etched terminations in excellent condition! See a close-up view of the tip of this natural yellow kunzite crystal. Natural Kunzite Crystal Dimensions: 5.8" long x 1" x 1"
This natural kunzite crystal has rich yellow natural color. Over 50% of its interior is of flawless gem-grade transparency! See another view of this amazing yellow kunzite crystal. This beautiful yellow kunzite crystal is naturally terminated. This rare quality yellow kunzite crystal would yield over 150 carats of flawless fine yellow kunzite faceted gemstones! See also a close-up view of the naturally terminated tip of this unique kunzite crystal. Natural kunzite dimensions: 4.3" long x 1.8" x 0.9"
This natural kunzite crystal has rich yellow natural color. Over 70% of its interior is of flawless gem-grade transparency! 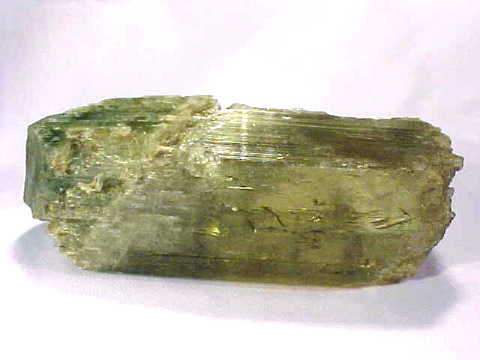 This yellow kunzite crystal is naturally terminated with some broken areas. This rare quality natural yellow kunzite crystal would yield over 250 carats of flawless fine yellow kunzite faceted gemstones! This is the end of our Kunzite Facet Grade Gem Rough virtual gallery page. To see more kunzite photos, just select another item category from the table below. To see photos of another mineral variety, select any item category link in our Mineral Inventory & Factsheet Index. Would you like us to inform you when we add on this page more natural color facet grade pink kunzite rough, lavender kunzite rough, blue kunzite rough, yellow kunzite rough or green Kunzite rough (also known as hiddenite)? We have a large inventory of natural color kunzite crystals in stock at our mineral warehouses, so be sure to let us know if you have any special requests. Please contact our webmaster or our 'site' geologist with any questions or comments.